I have always wondered how people can exercise without music. Music is one of the main reasons I exercise! When I get a break at work or on a Saturday morning, I look forward to listening to my music while I burn a few calories. 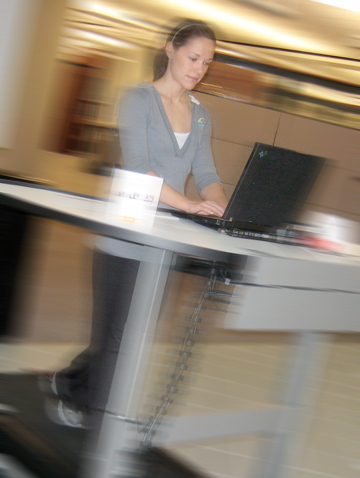 Working in onsite corporate fitness management, I see a lot of different types of people on a daily basis. While some members want only the TV on for noise, most have their own iPods and headphones so they can hear whatever type of music motivates them. Sometimes, while I’m looking out the window in my office watching people work out, I try to imagine what type of music they are listening to. I think it’s entertaining because I’m sure most of the time I’m way off. I personally find music very motivating. It helps to take my mind off the sweat running in my eyes and my lower-body muscles fatiguing out. I can also play mind games with myself using my music as motivation. 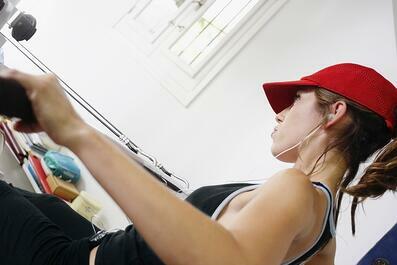 For example, I will speed up the treadmill or increase the resistance on the elliptical for the length of the song. This helps me to work harder and in turn burn more calories. I have discovered that I need to have mostly upbeat music because I move to the tempo of the song. For example, on the stair climber I find myself slowing down or speeding up according to the beat of the music. That’s why most group fitness CDs have warm-up and cool-down songs. This helps to get the body and brain in the mode to exercise and then to relax afterward. Discover tunes that motivate you and make a playlist that includes slower tempos for warm up and cool down and faster tempos for working hard and burning calories. (Add links to some sample playlists).